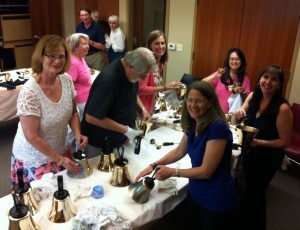 Celebration Bells is our handbell ensemble that plays during Sunday worship throughout the year. 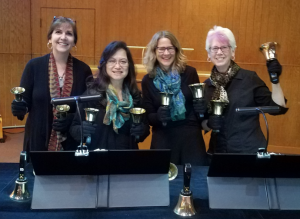 Besides playing for the congregation, we have enjoyed going out to handbell festivals, conferences, and workshops, and playing for retirement communities. 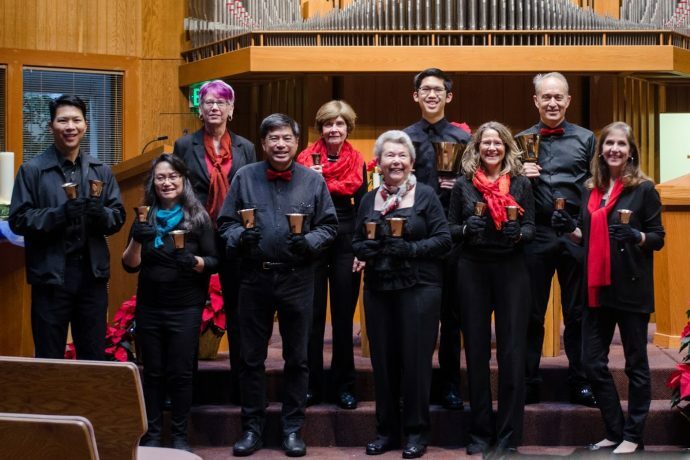 Our instrument is 4-1/2 octaves of Schulmerich handbells and 4 octaves of Malmark chimes, played by an enthusiastic team of 8 to 12 musicians plus several substitutes. We often play with other instruments such as piano, organ, cello, violin, flute, and percussion. What kind of music do we play? Everything from traditional and contemporary sacred and hymn tunes, to classical, pop, and just-for-fun arrangements. “CBs” rehearses on Sunday afternoons. New ringers are supported by the more experienced ringers, and together we create music that brings joy, comfort, and inspiration to others. If this sounds like fun and you’d like to check us out, please contact the Handbell Director, Mary-Marie Deauclare.